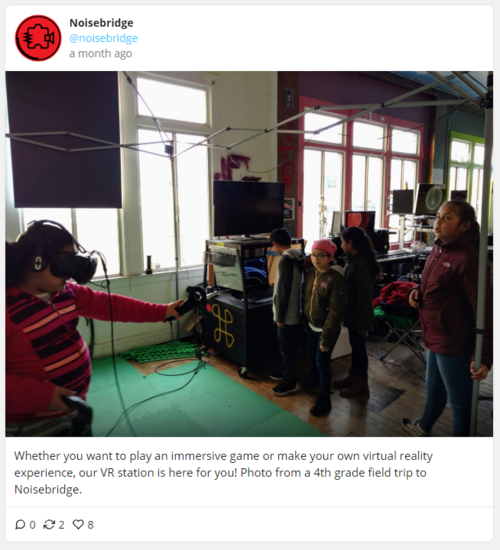 VRBridge is the Noisebridge virtual and augmented reality working group and is part of the Games guild. We communicate on Noisebridge Slack on #vr. We have an HTC Vive VR headset, Windows Mixed Reality headset, and a number of Google Cardboard headsets (for use with Android and iOS phones). In the back of Noisebridge we have a VR Cart with a VR PC inside with our HTC Vive attached to a 10x10 padded greenscreen cube. For access code, ask [#maintainers maintainers]. The MR headset has internal inside-out tracking cameras and works well for plugging into your own laptop. Install Microsoft Windows 10 (use Bootcamp to install it on Macs). We have an Oculus available by request. If you want to use one of our resources by request, contact any of the VR maintainers by email or Slack or during events. We meet on Tuesdays during Gamebridge. You can come to experience VR and play on the headsets we have. You can come to learn about VR development with Unity, Unreal and other engines. We specialize in teaching Unity game development and you can stick around till 8PM for the Gamebridge Unityversity's Codebridge Unity game programming class. Mark: Our 2D game development expert. More maintainers wanted! Ask about becoming one. 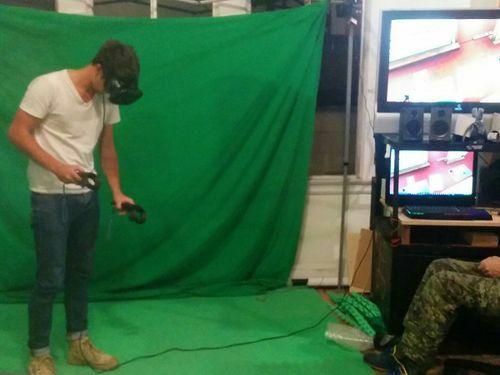 In march of 2017 we started building a VR cart to allow Noisebridge to have access to the newly purchased Vive and its associated computer. This page was last edited on 14 March 2019, at 13:47.